A person was left injured and suspected drugs were seized following a car chase in West Belfast . Shortly before midnight on Sunday March 31, officers from the Auto Crime Team noted a suspicious vehicle travelling country-bound along Divis Street and suspected it of having no insurance. 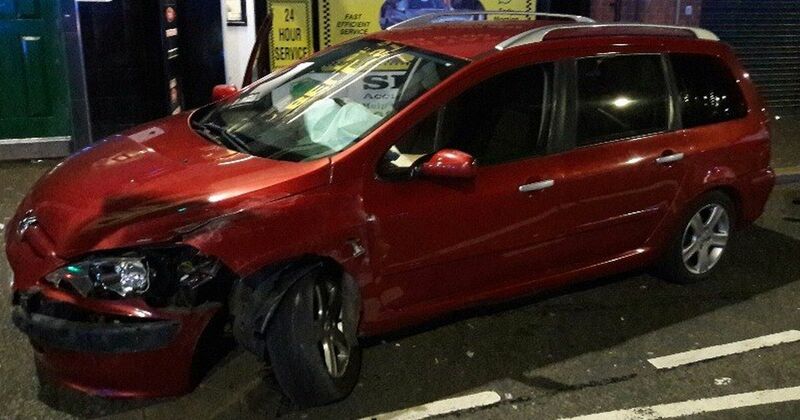 A police officer posted on the PSNI West Belfast Facebook page : “They signalled for it to stop but the driver of the Peugeot had other ideas and a pursuit commenced along the Falls Road. “This ended very quickly when the offending vehicle collided with another vehicle being driven by an unsuspecting member of the public. “Not only did this cause severe damage to the other vehicle, but the member of public was injured as well. “When the offending driver was detained it became obvious why he wasn’t keen on stopping as he was subsequently arrested for driving whilst disqualified, dangerous driving, no insurance, failing to stop for police. “The offending vehicle was searched and a small amount of suspect drugs were recovered with the offending driver now arrested for this also. “It is only by sheer luck that no one was seriously injured as a result of this incident and it still amazes us how often offenders are willing to put themselves and others at risk to try and make off from police.